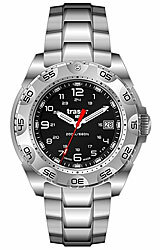 The Traser Survivor Pro is one of the brand new series from Traser. The spiritual successor to the Navigator series, the Survivor Pro take it to the next level with features like a genuine Sapphire Crystal and 10-year Lithium battery! Stainless steel case and bracelet with a srewn down crown and case back make this one of the toughest watches on the market today and full Tritium illumination means to can see the time anywhere in any condition. It's durable, dependable and ready for anything!